Today we're launching our new series Voices From the Archives. We'll be bringing you a selection of our favorite interviews from the past sixteen and a half years of The Marc Steiner Show. Today we’re launching our new series Voices From the Archives. We’ll be bringing you a selection of our favorite interviews from the past sixteen and a half years of The Marc Steiner Show. 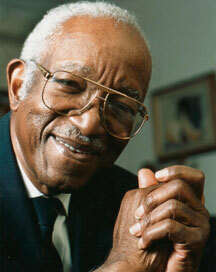 This hour, you can hear the great civil rights pioneer and historian John Hope Franklin. The interview was recorded on June 14, 2006. Sadly, Dr. Franklin passed away earlier this year. Later in the hour, we conclude with a segment from the Center for Emerging Media’s own Peabody Award-winning series, Just Words. You’ll hear Jacquetta Lyles, who was working as a day laborer at the sports stadiums in Baltimore.